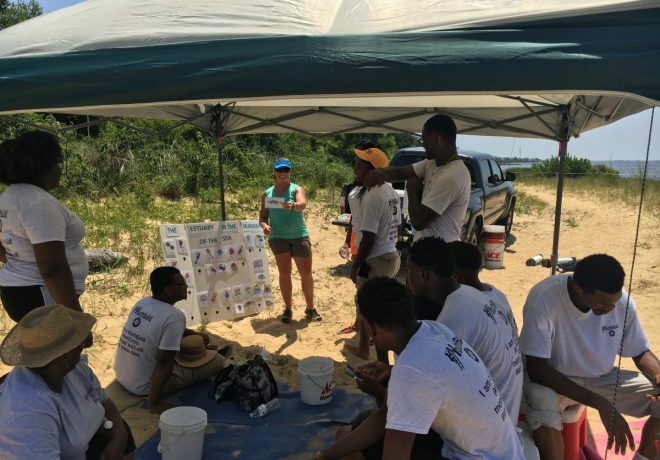 Eight students and two staff from River City YouthBuild visited the Northeast office on July 14 for a field trip to explore a living shoreline at Jockey’s Ridge State Park. Despite the weather — the hottest day of the year so far — the group had fun and learned about living shorelines and estuaries. River City YouthBuild is a community organization from Elizabeth City, North Carolina that provides economically disadvantaged young adults with education and employment skills through opportunities for work in their communities. The federation frequently partners with YouthBuild and engages youth through environmental restoration projects. Sara Hallas, education coordinator for the federation, led activities for the day along with Ladd Bayliss, coastal advocate for the federation. The group climbed a dune at the park, explored the federation’s living shoreline project on the Roanoke Sound and learned about estuaries. For many of the students, this was their very first time visiting Jockey’s Ridge State Park. 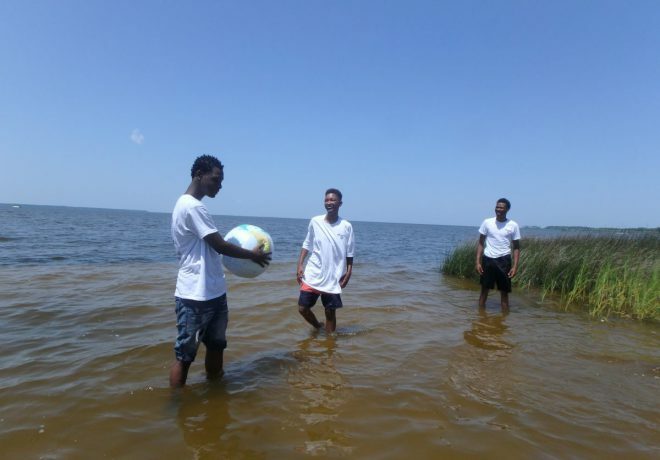 This was also the first time anyone in the group explored the federation’s living shoreline. 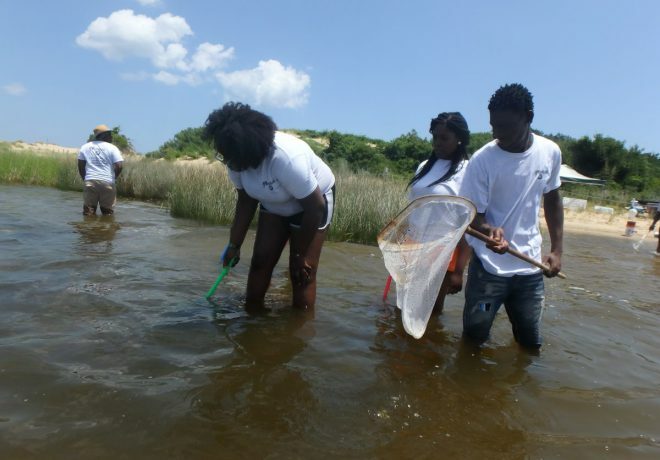 The group waded through the water and investigated the shoreline and its inhabitants, since estuaries are considered the nurseries of the sea. 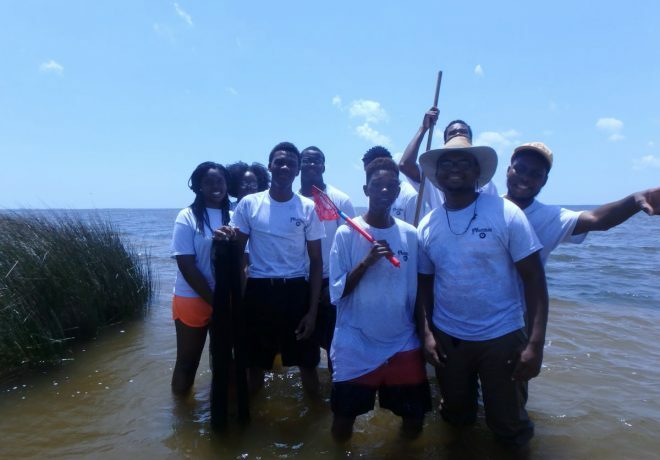 The YouthBuild group participated in a guided scavenger hunt along the vegetated shoreline and made new discoveries along the way. In addition to this, they participated in a matching activity, where they paired up juvenile and adult animals. They identified the live inhabitants they found while seining and using dip nets, with the help of Hallas and Bayliss. Because estuaries are nurseries, they learned more about how estuaries are valuable habitat for many species. Living shorelines maintain the natural functions of the shore and provide habitat, all while protecting land from erosion. Participants said the hands-on learning methods were effective and fun. Learn more about the federation’s work with YouthBuild and other community groups. Contact Sara Hallas for more information about educational opportunities in the Northeast.